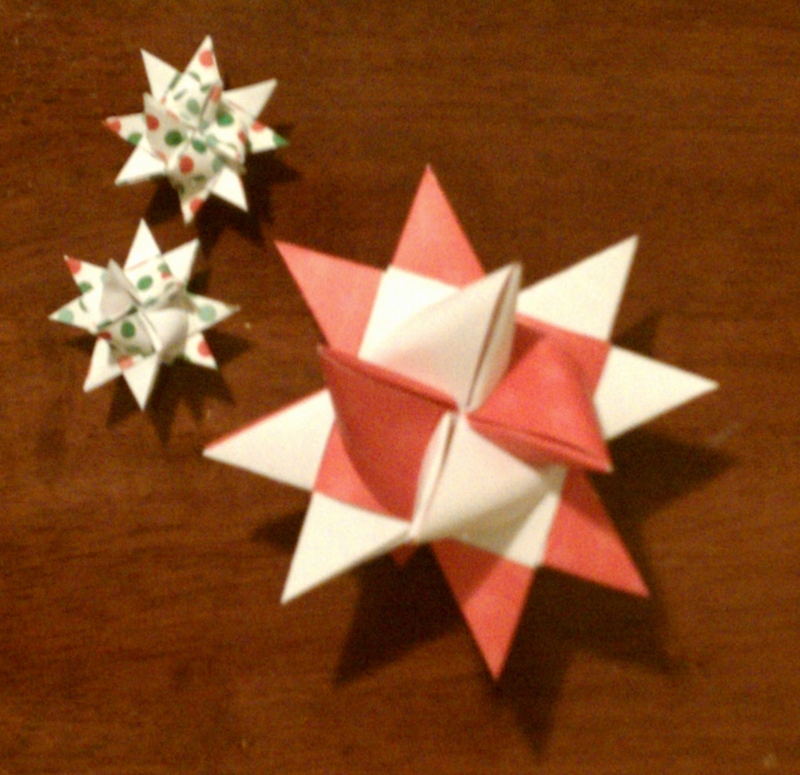 I found this great tutorial online for making Moravian Stars. I used 12 x 12 scrapbooking paper to make my strips. I made two different sizes. The strips for these small ones are 3/8″ wide by 12″ long. The strips in this larger one are 1″ x 24″ wide (I had to tape two strips together in order to make it long enough). Here’s how they compare in size to each other. I was looking for paper that was the same color on each side, however, I was able to get nice variations by arranging the strips differently before folding them. 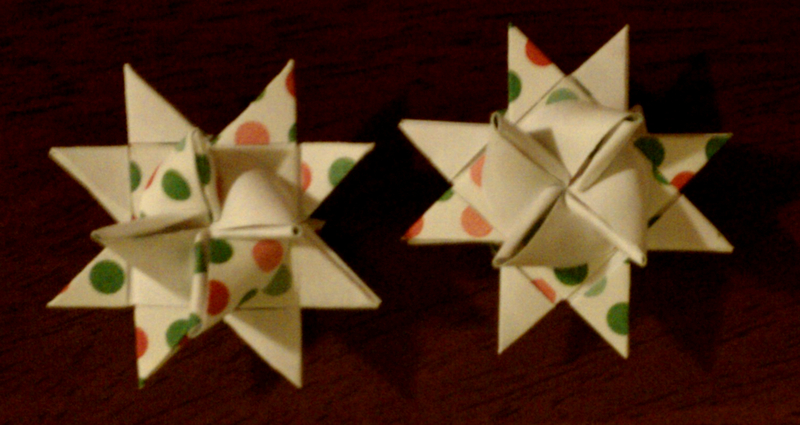 In one of the smaller ones, I folded the strips in half so that the wrong side of the paper was facing out. This created a pattern where the centers on side were patterned, the center on the other side was white, and the outside points alternated between pattern and white. 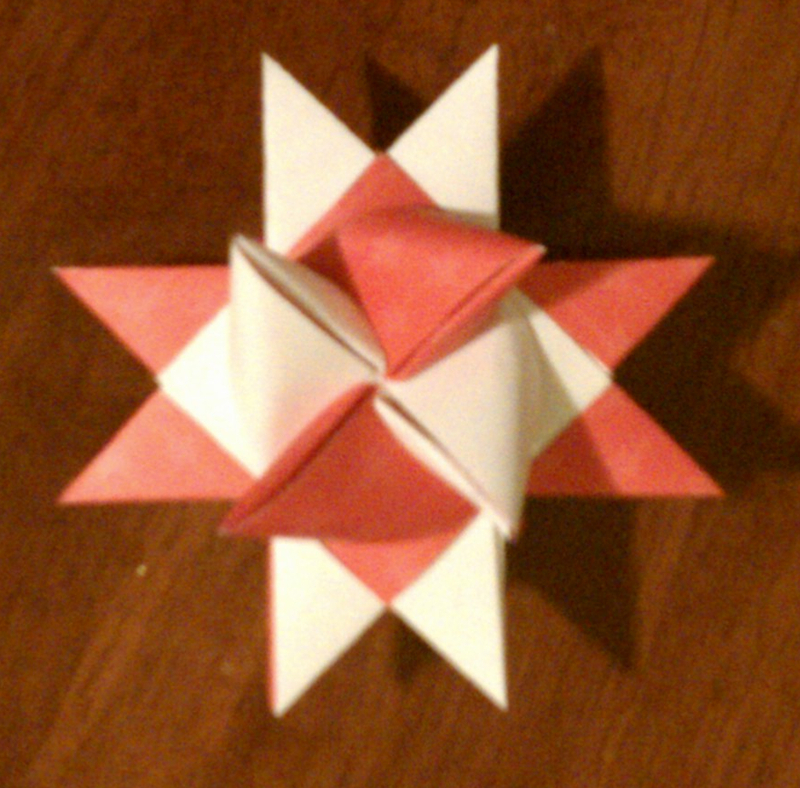 On the red star, I used two strips that were right side out and two strips that were wrong side out. This created the pattern seen in the picture above. These are a lot of fun to make. If you have trouble with the tutorial pictures, check out the video at the bottom. The only step that can be difficult to understand in the last one where you create the center points of the stars. You can use these for all kinds of things – package tie-ons, ornaments, and garlands. I’ve also read you can dip them in wax (which is a nice way to preserve it and make it one color). This entry was posted in Holidays, Papercraft, Tutorials. Bookmark the permalink. Love it. Those are really cool. You just get better and better with each of your projects. You just get better and better with each project!!!!! These are wonderful.